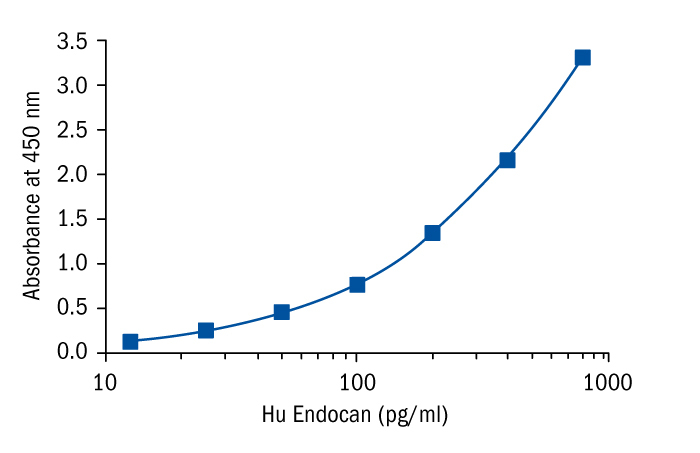 Endocan, also known as endothelial cell-specific molecule 1 (ESM-1), is a soluble dermatan sulfate proteoglycan (DSPG) secreted by activated endothelial cells with a molecular weight of 50 kDa. Endocan contains a core protein that consists of 165 amino acids and a single dermatan sulfate chain that is covalently connected to the serine 137. In contrast to large PG molecules whose main biological function is providing structural support for cells in extracellular matrices, endocan is basically a secreted molecule with low molecular mass. It has the property of binding to a wide range of bioactive molecules associated with cellular signaling and adhesion and thus regulating proliferation, migration and adhesion of different cell types in health and disease. The main function of endocan is to inhibit the interaction between intercellular adhesion molecule-1 (ICAM-1) and integrin LFA-1 on lymphocytes and monocytes and thereby affect adhesion of leukocytes to the endothelium and leukocyte migration into tissues. Under normal conditions, endocan is mainly, but not entirely, expressed by renal and pulmonary endothelium. Endocan expression is upregulated by cytokines, namely tumor necrosis factor-α (TNF-α), interleukin (IL)-1 and microbial lipopolysaccharide, as well as by proangiogenic factors such as vascular endothelial growth factor (VEGF). An increase in tissue expression or serum level of endocan reflects endothelial activation and neovascularization which are prominent pathophysiological changes associated with inflammation and tumor progression. Endocan has been shown to be overexpressed in several human tumors such as lung cancer, uterine cancer, kidney cancer, liver cancer, brain glioblastoma, breast cancer etc. and has therefore been implicated in the pathogenesis of malignancy and cancer angiogenesis. High endocan serum levels were shown to significantly correlate with presence of metastasis and with limited survival in kidney and lung cancers. The same relationship has been reported in a study of patients with hepatocellular carcinoma (HCC) showing that elevated serum endocan levels predict poor survival of the patients. Many studies have underlined the usefulness of endocan as an early predictor of acute lung injury or respiratory failure after major trauma and in septic shock patients. Higher serum endocan levels have been associated with subsequent development of postoperative pneumonia after cardiac surgery. Also, endocan blood levels have been found to be elevated in septic patients as well as in immunocompromised patients with complicating bacterial infections. In patients with subclinical as well as severe atherosclerosis increased endocan levels were observed and were associated with endothelial activation and dysfunction. A recent study found that higher plasma endocan levels can predict the presence of isolated coronary artery ectasia (CAE). Significantly increased endocan levels in maternal plasma of women with preeclampsia (PE) in the third trimester of pregnancy, makes it a great candidate for use as PE biomarker.